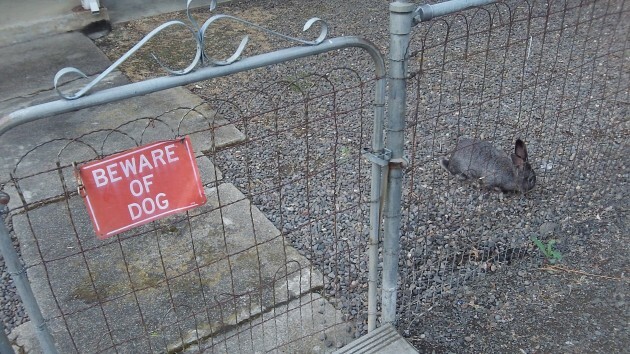 It’s one thing to put a warning on your fence, perhaps to discourage people from coming to your door to sell you something. It’s another to make people believe it. Chances are it won’t work if you undercut the message by letting passersby see who really guards the place. This rabbit was digging in its graveled Jacksonville yard, apparently looking for a snack, without much luck as far as I could tell. He (or she — who can tell?) was also snuffeling around the bottom of the fence. Perhaps thinking of escape? It wasn’t to get away from the dog, that’s for sure, for no dog was in evidence. Why am I mentioning this? Good question. Because I happened to see it, mostly, and it’s a slow night on the blogging front. And also because this scene looks a little like a symbol of our times: Lots of warnings. Beware of this and that. Danger here and there and everywhere. Thanks for the chuckle HH! No hunt in that “dog”. Just left you something to pursue on your failed “green” project to buy post. Have a good & safe ride! !